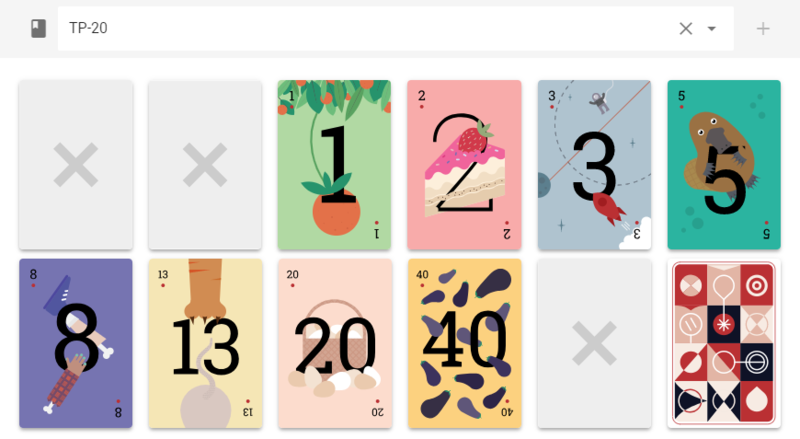 The latest release of Scrumpy Planning Poker is focused on the different types of card types for estimation. 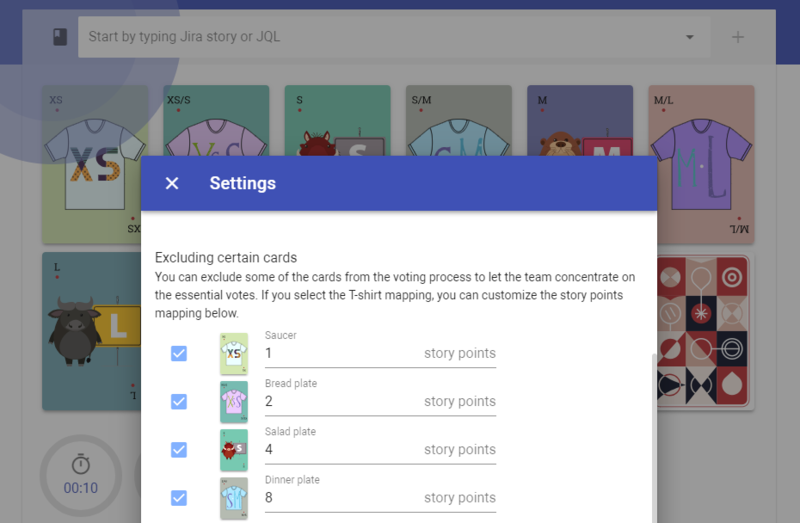 With this release, the application now supports different type of cards and custom story points mapping that can fit every case like Fibonacci and T-Shirt story sizing. The new features were carefully crafted according to the Feature Requests page and the received up-votes. Before, there was only one type of card sequence – 0,0.5,1,3,5,8,13,20,40,100. From the settings page, now you can select a few more sequences which have a different purpose. For example, the Fibonacci sequence is more accurate when estimating more complex tasks, while the T-Shirt estimate is not bound to points and can have a custom mapping from a T-shirt to story point. The sequence can be chosen at any time from the Settings page. The Settings page can be open only when there is no current voting session. 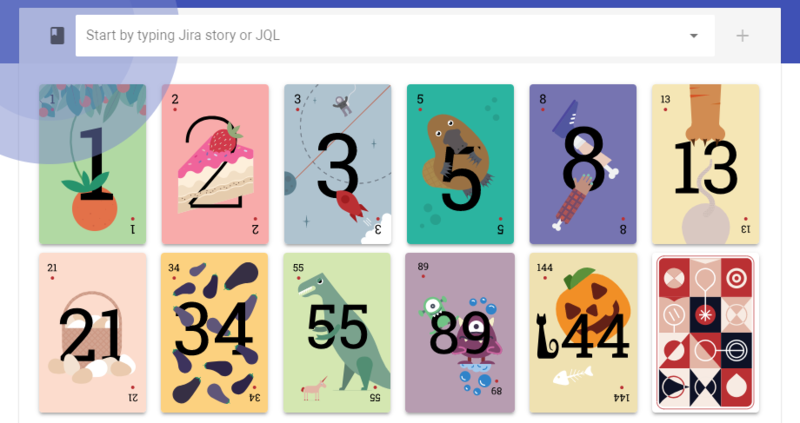 Before, Scrumpy Planning Poker used only the most commonly used cards for estimation, which partly resembled a Fibonacci sequence, but was not exactly this. Now, the real Fibonacci sequence of 1,3,5,8,13,21,34,55,89,144 is available. The Fibonacci sequence is more convenient when estimating more complex tasks which are above the regular 1-13 set of estimates. 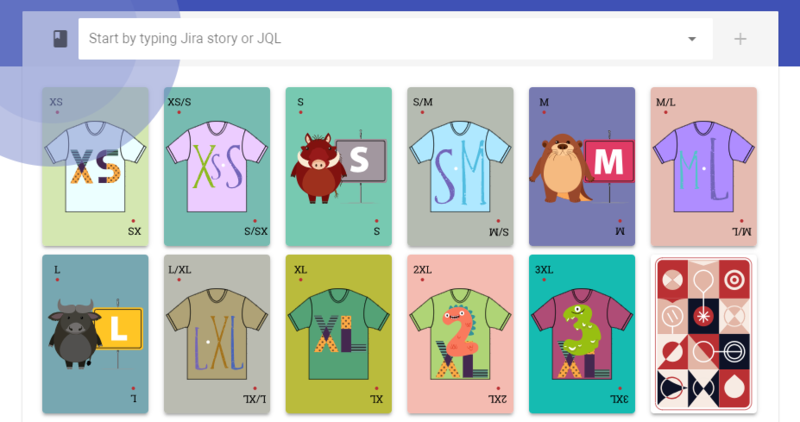 The T-Shirt story sizing is convenient when stories are not visually bound to story points, but to T-shirt sizes. This way the voters evaluate tasks by small/big scale without thinking about the story points. This card sequence allows custom mapping to any type of ascending story points. The scale can be linear, progressive, exponential or anything that fits the project. The adjusting of the mapping from a T-shirt to story points is available in the Settings page. Note that only ascending mappings is supported, e.g. the cards must be ordered from small to big. All those nice features have been implemented thanks to our users – they have requested and we have implemented them. 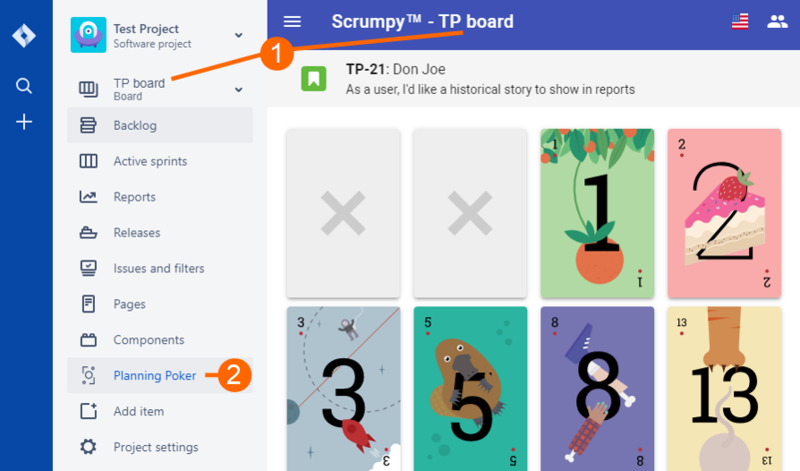 Please help Scrumpy Planning Poker become even more convenient for you by submitting a feature request to our Feature Requests page or up-vote an existing feature that you find useful. Thank you! 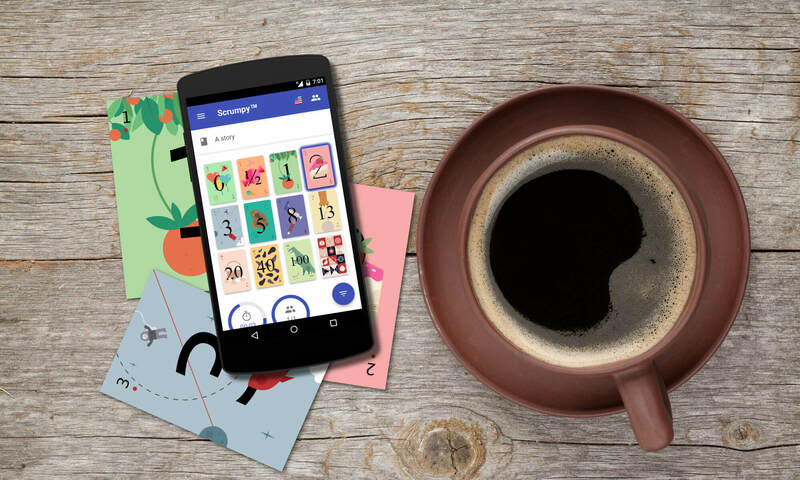 This release is the result of our new program to let our customers build Scrumpy Planning Poker the way it fits best their needs. We’ve opened a separate page for collecting ideas and allowing up-voting. The page allows both us and our customers to freely submit ideas. Those ideas are edited and published in the ideas section of the page. 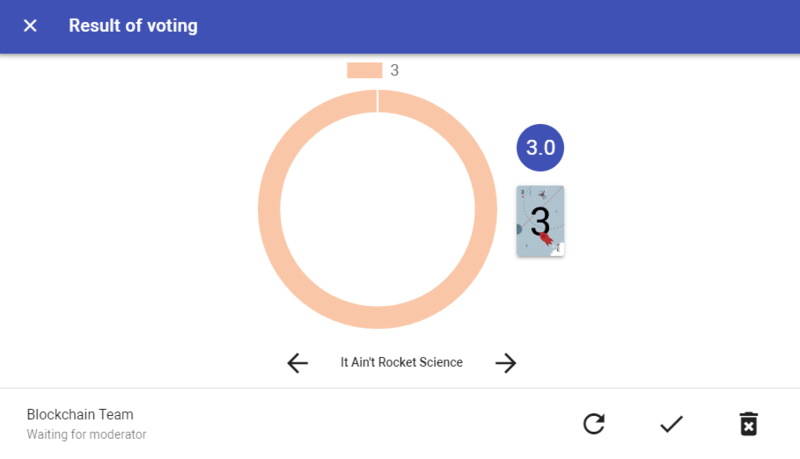 Then anyone can vote up or down for a feature. We are implementing those feature requests according to the priority and include some of them in the next release. The new features are documented at the bottom of the same page. 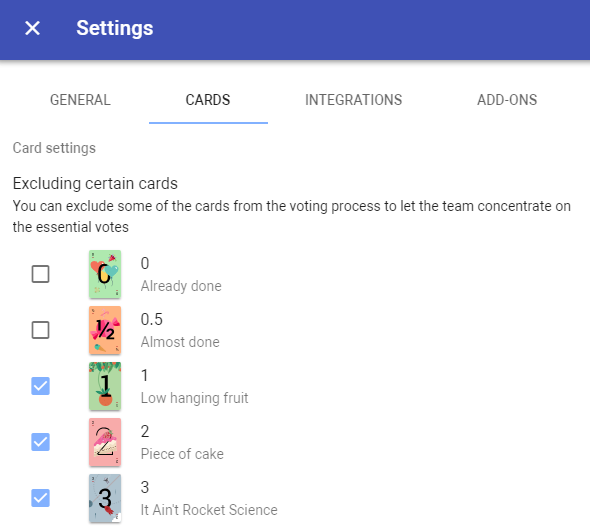 Once the cards are excluded from the check mark in the Cards settings, they are marked as unavailable in the voting section to avoid disconcentrating the players. Now inside the Jira plugin the currently selected board is used to map to a room, or the project itself when used in the root dashboard. The board is the closest match to ‘Team’ in standard Jira installations. In the future we might extend this to support Jira Portfolio teams. Mapping board per poker room. Each project can have more than one board. If no board is defined, the project is mapped to a room. The project space now has a shortcut to the currently selected board’s poker room or the project itself if no board is defined. The Estimate button has been removed as it is much easier to use the new JQL query in the search box. Now IE11 is a supported browser. Before we didn’t consider this browser at all, but since it was submitted as a feature request and up-voted so it became a supported browser. Thank you all for submitting those nice and useful ideas! You can get back at any time to the feature requests page and tell us what you need or provide some instant feedback from inside the application.